Both engines were operating normally until they each ingested at least two large birds (weighing about 8 pounds each), one of which was ingested into each engine core, causing mechanical damage that prevented the engines from being able to provide sufficient thrust to sustain flight. 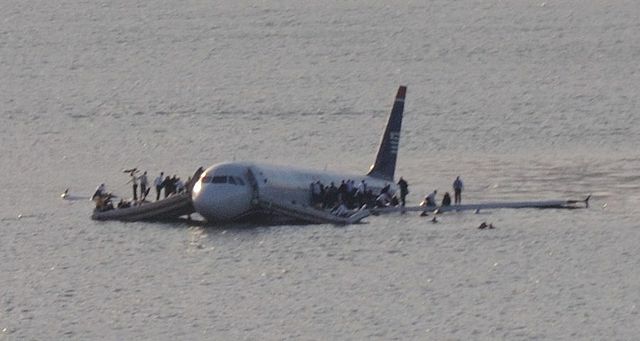 Consequently the aircraft was forced to ditch in the Hudson River. The 155 passengers and crew members successfully evacuated the aircraft and were rescued with only 5 serious injuries. The executive summary of the NTSB report covers many aspects of Crew Resource Management (CRM), training, ditching procedures / certification and survivability related to actions after a bird strike that prevent continued safe flight. 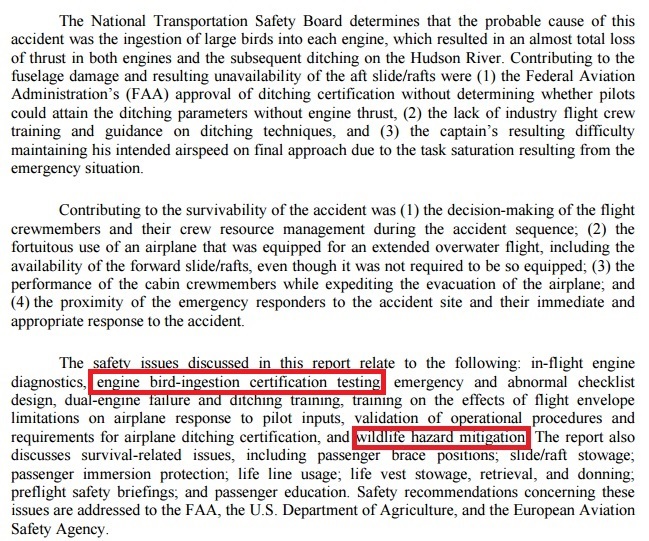 The NTSB summary only briefly mentions mention engine certification standards and wildlife hazard mitigations to prevent critical damage. In this article we look at how hindsight from previous occurrences demonstrated the potential of such an accident and how prediction had shown the probability of a catastrophic bird strike outside the airport boundary was increasing. 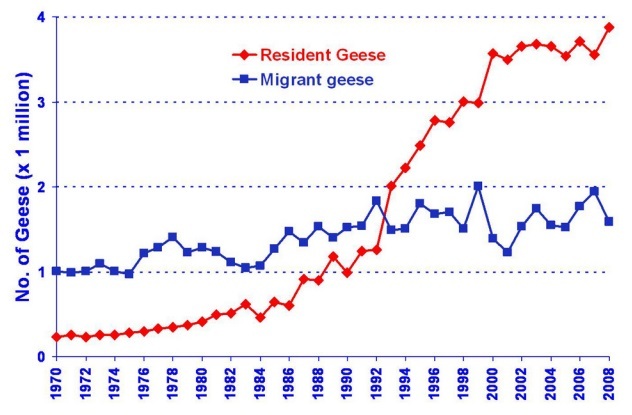 The nearly 20 fold increase in resident geese is significant as that means even greater exposure throughout the year. This change in behaviour had come about because Canada Geese had increasingly been adapting to live year round in parks, golf courses and waterways in an around urban environments, while still flying in skeins to local feeding areas. Readers of the NTSB report might conclude that this was something of a surprise to the industry. In some areas of North America, the risk of such an encounter may be approaching a critical level. This was 8 years before A320 N106US lost power from both engines and ditched in the Hudson River. At that time rule making to enhance engine bird strike resistance for new engines was already under way. As there was little that could be done to enhance existing designs this paper was intended to highlight the critical need to take proactive environmental action to manage bird habitats. While this included measures on and close to airports it also crucially included wider actions involving non-aviation stakeholders, the UK CAA paper endorsing a set of recommendations from the Aerospace Industry Association (AIA). Although the Flight 1549 bird strike occurred beyond the range of the airport’s wildlife hazard responsibilities, the NTSB’s only environmental safety recommendation (A-10-75) after the Hudson ditching was focused on airports. This recommendation was directed to the Federal Aviation Administration (FAA) to ensure all US Part 139 US airports had conducted a Wildlife Hazard Assessment (WHA) and implement, if needed, a Wildlife Hazard Management Plan (WHMP). 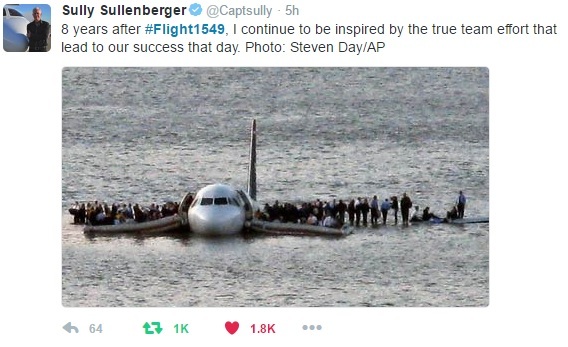 Completely contrary to the basic concept of a Safety Management System (SMS) and risk management principles a WHA is still today only required after a ‘triggering event’ according to 14 CFR 139.337 and this recommendation remains classified as open by NTSB. One press report states that the Port Authority of New York and New Jersey (PANYNJ) has killed 70,000 birds between 2009 and October 2016. Just 1,830 were Canada Geese, with the majority much smaller birds. The really powerful risk mitigations remain those to manage bird habitats in urban areas. Meanwhile Aerossurance is aware that, we think bizarrely, the concept of ‘Prediction’ is actually going to be removed from the next revision of the ICAO Safety Management Manual to leave just ‘Reactive’ and ‘Proactive’ approaches. Having three categories is allegedly seen as “too confusing” apparently. We think that’s a retrograde step. Some readers might be sceptical that even though it was being discussed around a decade before the Hudson River ditching, the aviation industry and wider stakeholders could really be expected to see the significance of the rise in the Canada Goose population before a major accident (in the same way that WHA’s are only required after the first ‘triggering event’ at an airport). June 1995 an Air France Concorde struck Canada Geese while landing at John F. Kennedy International Airport. Two of the four engines caught fire and were destroyed. Air France sued the airport operator. The case was settled trial for a reported USD$5.3 million. September 1995 a US Air Force (USAF) Boeing E-3B crashed on take off in Alaska killing all 24 on board. 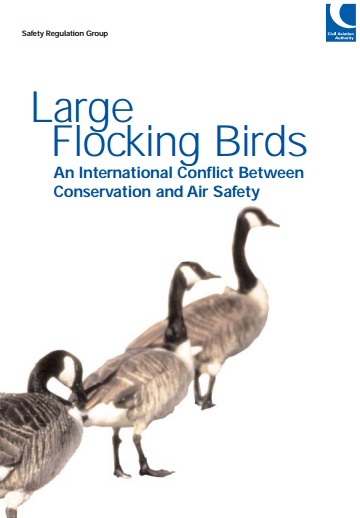 The investigation concluded that the probable cause was the ingestion of Canada Geese into number 1 and 2 engines after they had been disturbed by a previous aircraft’s take off. September 1998 a United Boeing 767-300 struck a flock of geese just prior to touchdown at London Heathrow. This caused extensive to the left hand side of the aircraft. This occurrence lead to a number of AAIB safety recommendations. November 1998 a British Airways Boeing 747-100 encountered a flock of approximately 40 Snow Geese ( a smaller member of the goose family) beyond the airport boundary while executing a missed approach at Montreal Airport, Canada. The number 4 engine was shutdown, and a safe landing was made. The number 3 engine controls jammed at idle during taxy. Damage was found across a 120ft span, greater than the engine spacing on the largest twin engined transport aircraft in service. March 1999 a USA Jet Airlines McDonnell Douglas DC-9-15 encountered a flock of Snow Geese while on final approach at Kansas City International Airport. Several birds were ingested into both engines, resulting in severe engine power loss. The left engine suffered repeated compressor stalls and the other went to a sub-idle condition. The captain reduced the power on the left engine just enough to lessen the surge/stall condition and allow enough thrust to successfully complete the approach. This occurrence lead to a number of NTSB safety recommendations. One (A-99-087) was for the FAA to “in coordination with the U.S. Department of Agriculture, conduct research to determine the effectiveness and limitations of existing and potential bird hazard reduction technologies”. This was closed based on a 5 year work programme though no mention was made of investigating potential technologies. One challenge air accident investigators face is that to even have a chance to be effective, safety recommendations need to be directed at an organisation with the authority to take action. This could be one reason why there has been a reluctance to make fairly general societal recommendations (on matters such as off-airport bird habitat and population management) to non-aviation organisations. 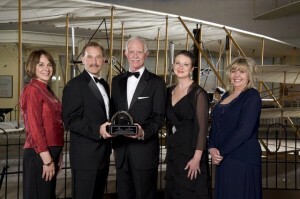 The flight and cabin crew of US Airways Flight 1549 was deservedly awarded the 2010 Smithsonian National Air and Space Museum Trophy for Current Achievement. Coincidentally the Smithsonian plays a key role in the US identifying bird debris after bird strikes. Can you turn a crisis around in 208 seconds? In times of intense pressure it can be difficult to remember the leadership skills you’ve learned throughout your career. When a catastrophic situation strikes, we go into ‘fix-it’ mode, and often forget to step back, keep calm, and bring in other opinions. As leaders it’s important to remain unmoved through chaos, and to be the rock your team can gather around. So how do you react when things go south? Do you look for runway or… face the river? 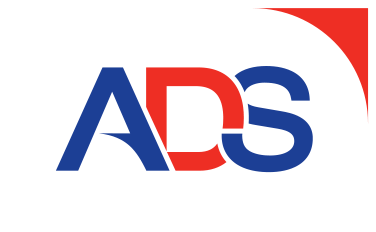 Aerossurance has recently discussed Safety Intelligence & Safety Wisdom on how decision makers can make better informed decisions on safety matters and High Reliability Organisations (HROs) and Safety Mindfulness about shared awareness of emerging threats.